Arrrr Mateys! Do you have an extra little nook or closet in your house that is just collecting dust and clutter? 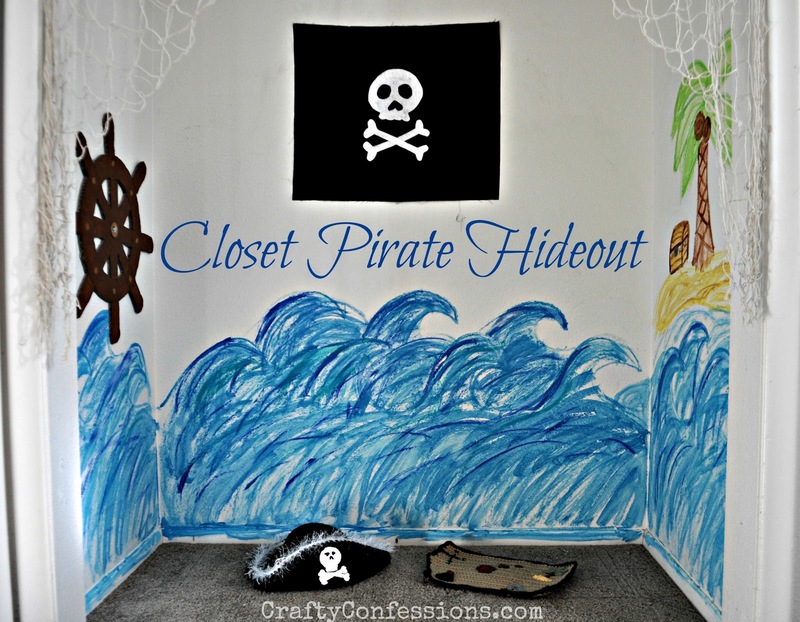 I have the perfect solution for you today: A closet Pirate Hideout! My boys share a room with two closets, but only one was being used for clothes and the other was being used to hide their messes. Between that, and the fact that the doors kept coming off I decided to do away with the second closet, and turn it into something more useful for my playful little guys. After removing the doors I also removed the bottom track. 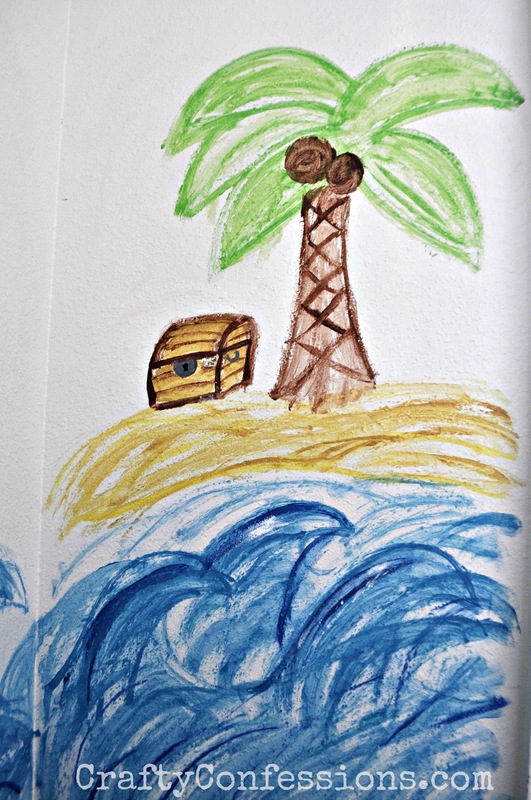 After that I painted a fun little ocean scene on the wall. I was going for a children's book illustration effect. 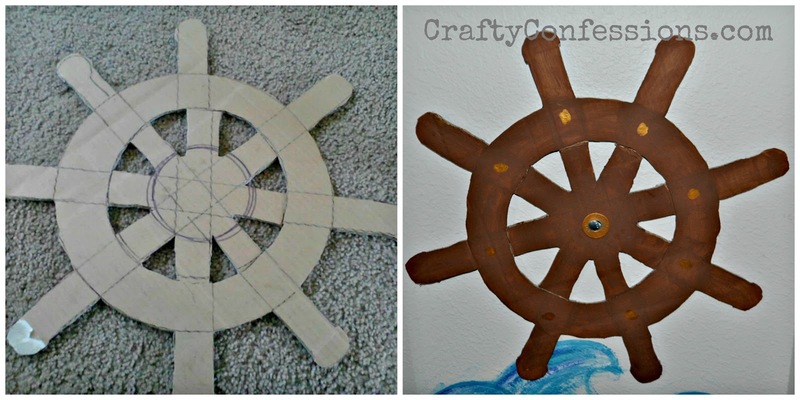 Next, I cut out a wheel shape from a cardboard box and painted it. I super glued 1/2" washers to both sides so the cardboard wouldn't wear down as the wheel was turned. Finally, I secured it to the wall with a bolt, and a large nut behind so it wouldn't be flush with the wall. This is one of my favorite features because the wheel really turns! Next came the flag. 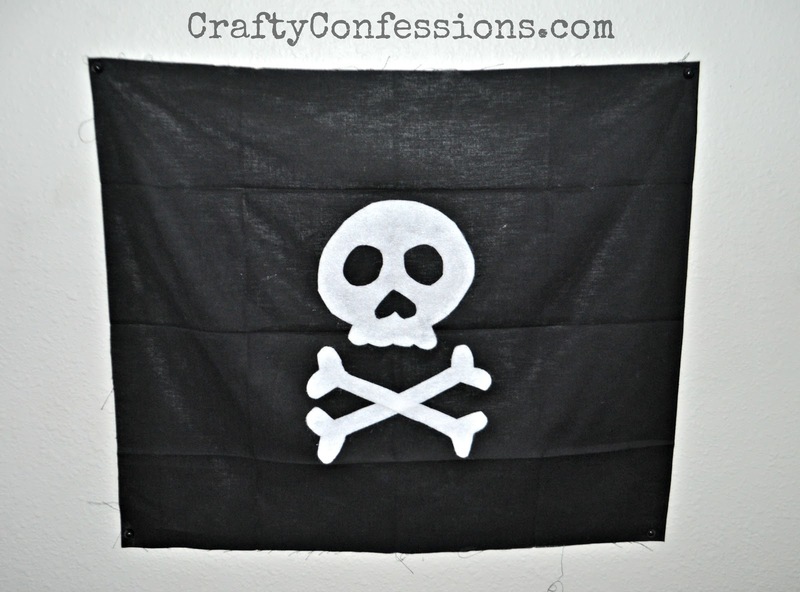 It just isn't a true Pirate Hideout without the Jolly Roger. I used a $.97 fat quarter from Walmart and a $.30 piece of white felt. I learned the greatest trick on Pinterest: If you put contact paper on the felt and then cut out your shape it is 100 times easier!! I used Fabric Fusion to attach the felt to the black fabric and let it dry. I like the frayed look, so I didn't bother hemming the edges. 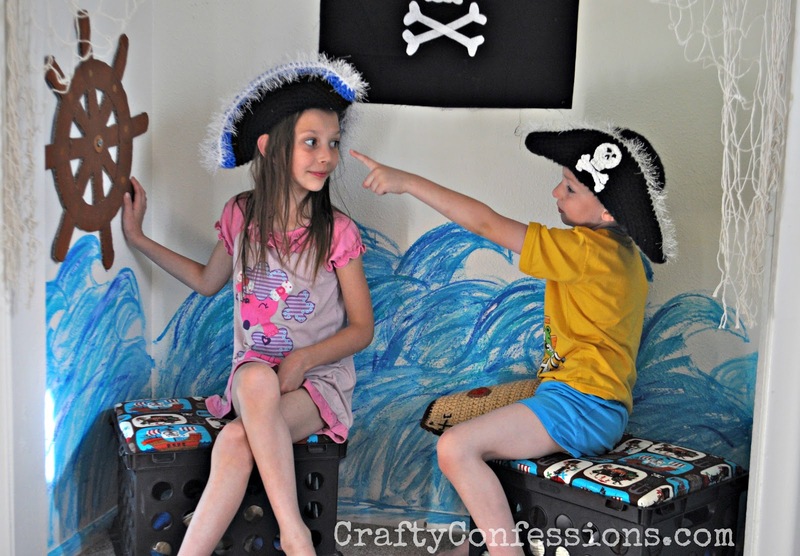 I already made the pirate crate seats a few months ago, so they were ready to go. Finally, I bought two decorative fish netting from the Dollar Tree and hung them as curtains. They gave it the perfect finishing touch. 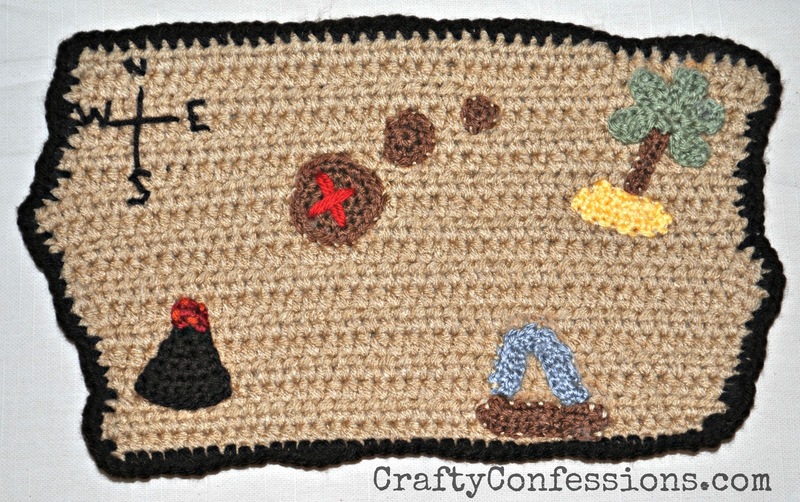 A few pirate hats and a treasure map that I crocheted made perfect accessories. I'm working on a purple Pirate Princess hat for Samantha. 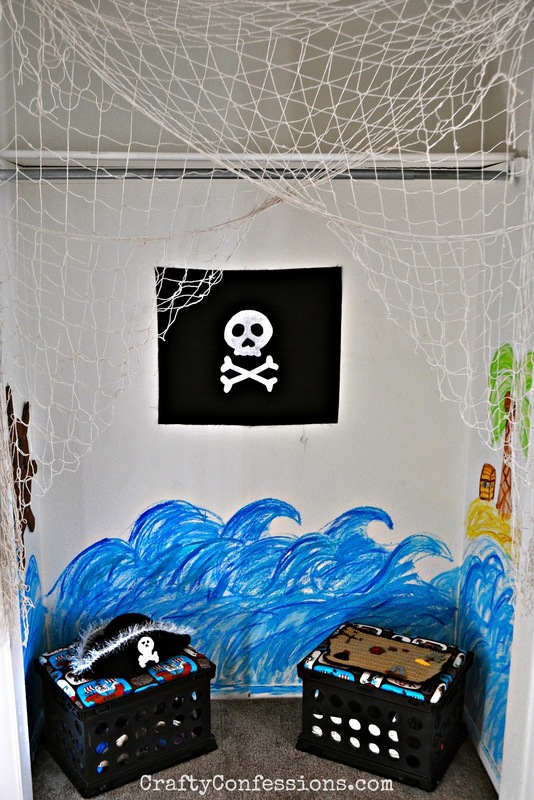 This was such a fun and rewarding project to do for my kids, and has already helped cut down on the bedroom clutter. 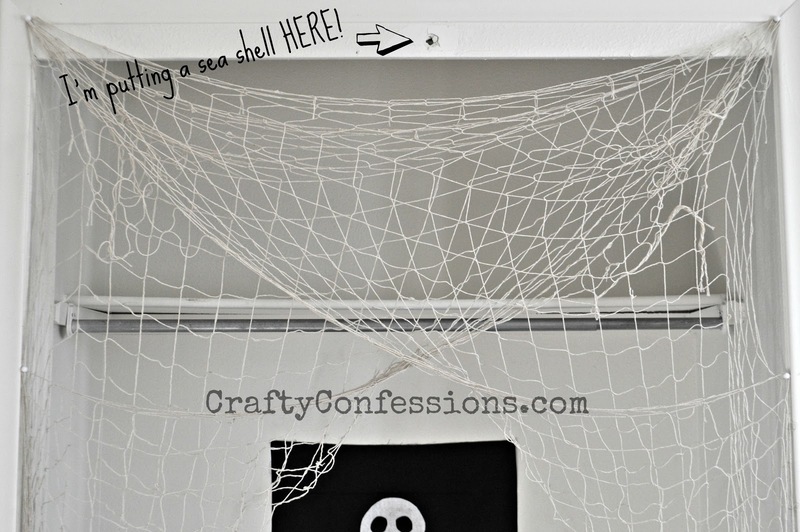 Best of all, I had all the supplies on hand except the netting, so it only cost me $2 to make! I bet the kids have so much fun!! Oh, Wow! I have a few grandsons that would LOVE a special place like this. You did a great job adding perfect pirate details. So nice stopping by to visit! I am just wondering if men like ladies more or what. guy's rooms. Why may be the net filled with horny guys but no girls? I can't believe you _crocheted_ the map! Insanely more complicated than drawing one but i have to say i love the one you did. Wish you had better details on making the cardboard wheel shape. Definitely better than what we started to make, but then again you used a ruler and probably a compass. Details please..
Had me exercising those kids from the day they were born, Mike mom, Toni Zadick, said. Their arms and their legs. The girls as well as the boys. The final key to the way I promote is bravado. I play to people's fantasies. People may not always think big themselves, but they can still get very excited by those who do. I contacted him and i told him my same color t shirt problems and gave him all the urban t shirts necessary information he required. He just laughed and told me never to worry that my husband will call me back in less than 28hours and i believed and he told me what to do and i did it, and after he has finished casting the spell my husband called me and started begging. He apologized and came back to me crying for a second beard shirt chance.